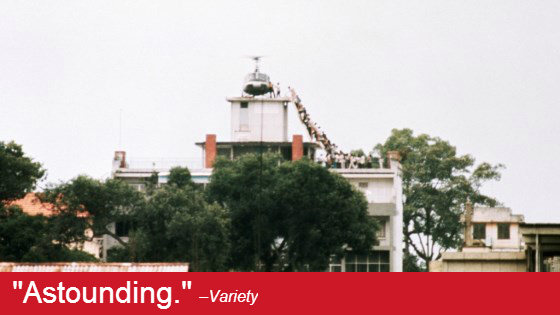 Award-winning director Rory Kennedy takes a stunning look at the chaotic final days of the Vietnam War. As the North Vietnamese Army closes in on Saigon and a Communist victory becomes inevitable, the small number of American diplomats and military operatives still in the country prepare to withdraw. With no prospect of an official evacuation of South Vietnamese, they are faced with a difficult choice: obey White House orders to only evacuate US citizens or risk treason charges to try and save their South Vietnamese allies, friends and families from certain imprisonment and possible death. With the clock ticking and the city under fire, a number of heroic Americans take matters into their own hands, engaging in unsanctioned and often makeshift operations in a desperate effort to save as many lives as possible. Executive producer Mark Samels will be in attendance to introduce the film and answer questions following the screenings.